Counter-clockwise from top-left: Jim Blinn, Julian Gomez, Sylvie Rueff, and me. Last week I participated in a panel at the annual Siggraph computer visualization conference celebrating the fortieth anniversary of the Jet Propulsion Laboratory’s legendary Computer Graphics Lab, where I was Artist in Residence between 1976 and 1988. My co-panelists were computer scientist and animator Jim Blinn, technical specialist Sylvie Rueff, and the lab’s first Systems Engineer, Julian Gomez, who organized the panel. The NASA/JPL Computer Graphics Lab supported science, art, and fundamental research in the 1970s and 80s, at a time when almost nobody on the planet had seen a 3D computer-generated image. 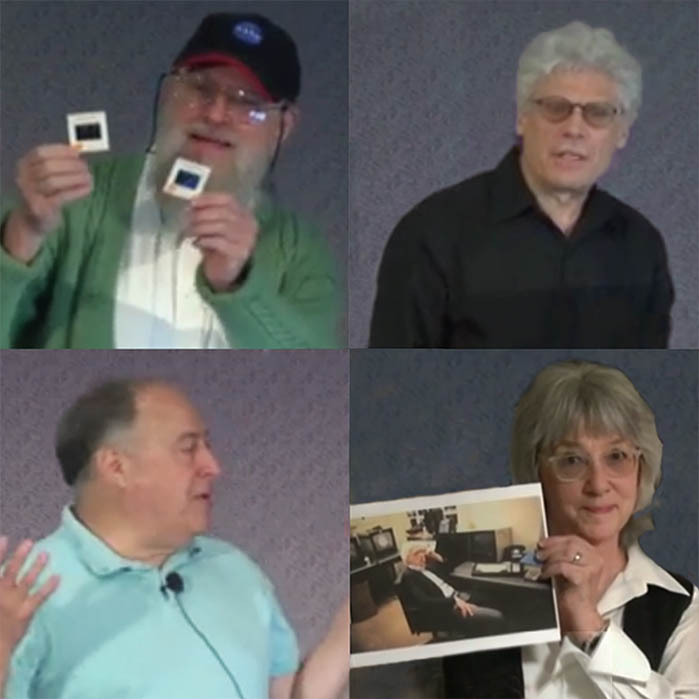 The panel covered a lot of territory, including the making of Jim Blinn’s groundbreaking Voyager spacecraft planetary flyby films, the visionary management style of the lab’s founder, Bob Holzman, and the challenge of making pictures and movies on a computer the size of a horse equipped with only a small fraction of a megabyte of RAM.